Poly-L-lysine trifluoroacetate is a positively charged synthetic polyamino acid having one TFA per lysine unit. It is a crystalline solid soluble in water. 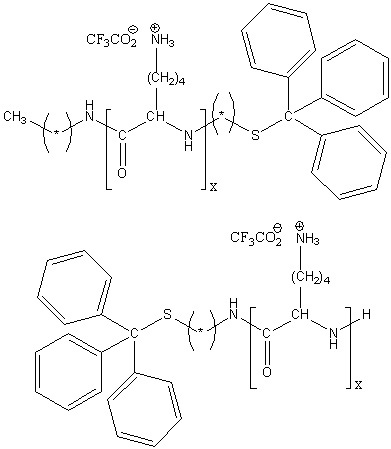 Applications for poly-L-lysine TFA include the conjugation to active molecules for improved activities, the layer-by-layer deposition techniques, and the complexation with nucleic acids for gene expression. This particular poly-L-lysine trifluoroacetate has either a non-reactive alkylamide function on the C-terminal and a trityl protected thiol on the N-terminal or a trityl protected thiol on the C-terminal. The trityl group is easily cleavable using a TFA/Et3SiH (98:2 v/v) mixture. Store mercapto-poly-L-lysine trifluoroacetate under the condition of flushing with argon and protecting from light, and below -15°C.